This week’s episode of Supernatural managed to cram a lot into its 42 minutes, moving along the rebuilding of the brothers’ relationship, bringing Cole back into the fray, taking the angel storyline on a brand new tangent and introducing a new and intriguing character with a surprising (albeit spoiled a while ago – thanks, social media) link to Crowley. I have to start by saying I found Girls Girls Girls to be a cluttered and somewhat rushed episode and that was possibly because of the overwhelming amount of story movement. There were definitely solid advancements to storylines that are developing and the moments between the Winchesters were precious as always, but I felt it could have been stretched over two episodes. Sam and Dean’s interaction in their opening scene was once again reminiscent of early seasons, a comfortable rapport melding with easy-going ribbing as Sam discovered Dean was a member of a dating app. [Trivia: Listed under “interests” on Dean’s page was “Rolling through town, no strings attached. Interested?” This was Jensen Ackles’ reply at Comic-Con when asked what Dean’s dating profile would say and writer Bob Berens immediately knew he had to use it.] Sam took great pleasure in making fun of the profile, although I feel Dean using his real name on the site was a tactical error given their paranoia about discovery. Seeing Sam’s easy laugh and Dean’s ability to find the humor in his own actions gave the whole scene a feeling of contentment. Even Sam’s appreciative once-over of Dean’s “date” as he watched his brother leave with her was a throw-back to the more relaxed Sam of old. The conclusion of the Castiel and Hannah storyline made me sad for a number of reasons. I’ve enjoyed the chemistry between Misha Collins and Erica Carroll and it has afforded us the opportunity to see Cas floundering when confronted by emotions completely alien to him. I also found Hannah’s realization about Caroline, her vessel, to be heartbreaking. The question of the morality of taking a vessel has been touched on some over the past 5 seasons and Castiel’s vessel, Jimmy, was given the chance to show his side of the story in the season 4 episode The Rapture. But when Hannah encountered Caroline’s husband, Joe, and described hearing Caroline scream at him from inside her it really brought home that while these vessels say “yes” to angel possession they are forced to sacrifice and suffer more than they realized. Caroline’s humanity was giving her possessor urges and emotions that otherwise she wouldn’t have and as Hannah’s commitment to her and Castiel’s mission has been wavering of late, Caroline’s grief was the final straw. With a farewell chaste kiss Hannah said goodbye to Castiel and left Caroline’s body. But to where? We are led to believe that Metatron’s elevator can only be used when in a vessel so she can’t be going back to Heaven. Hannah’s departure was one part of the episode I felt could have used more screen time. Erica Carroll had developed the character nicely and I’ll certainly miss her. Hannah’s moral dilemma about her vessel brought to the fore other morality questions that the show could touch on. Angel vessels are always so well protected and considered, even though technically they are willing participants. However, in recent seasons there has been little to no regard for demon meatsuits. We have to remember that part of Sam’s motivation for continuing to drink demon blood in season 4 was that his method of exorcising generally saved the life of the possessed. Lately Dean has been more violent in his killings and I think we can attribute that to the effects of the Mark of Cain; Sam’s concern shows on his face during every fight. But that’s only a small part of the consideration here and with Hannah’s confession about the guilt she felt maybe now would be a good time to start addressing it. This also brings up a nagging concern about Castiel. Jimmy’s body has been gone for some time now; we assume his current visage is a “favor” much like when Anna regained her image. And with the stealing of another angel’s grace it begs the question: Who is Castiel? Is grace the equivalent to an angel’s soul, meaning he would be someone completely different considering the grace he contains isn’t his? One thing is certain and that is Jimmy Novak is no more, so Cas’ search for his family is going to have interesting consequences if he succeeds. I wonder if he will now give up his search for rogue angels and concentrate on his new “mission”? I am feeling like Castiel’s story is moving in a completely different direction than Sam and Dean’s this season, however, and I’m not sure how, or even if, it will all tie together. I liked the introduction of Rowena, the witch. She’s an interesting character, one who could be a legitimate foe for the Winchesters. I found her humor appealing and as a Brit I was very happy they cast someone (Ruth Connell) with a genuine Scottish accent! I can see her hatred for demons being a compelling reason for her to help out the boys on occasion and, given Dean’s intense dislike of witches, that could offer up some amusing scenarios. While the big reveal at the end of the episode, in Crowley’s dungeons, wasn’t a surprise to me like it was to some, I’m intrigued to see where it will be taken, considering Rowena’s feelings towards demons and Crowley’s less than affectionate response to the family we have seen him encounter to this point. I’m definitely looking forward to their interactions which I feel could come down to a hilarious battle of sarcastic wit! 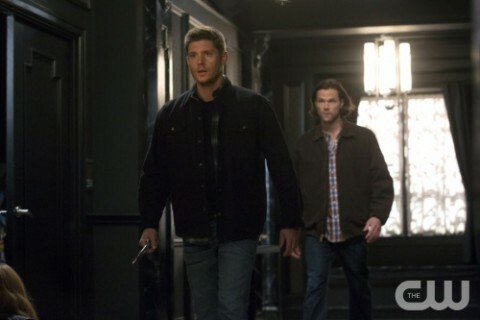 Another part of the episode that I thought could have used more time to explore was Cole’s showdown with Dean. The scene itself was brilliantly played by Jensen Ackles and Travis Aaron Wade, with a high degree of emotion and another intense fight scene. At Dean’s insistence that no, he wasn’t a demon when he had killed Cole’s father, Cole stated “Then you were still a monster.” This has been the theme for some time, that of “what constitutes a monster” and Dean did not deny that, although he managed to explain the reasons behind his actions. As Sam told Cole that he had a family who wanted him back whole it became a nice parallel to his own fight to save his brother. Dean’s insistence that he was past saving was gut-wrenching and the hurt on Sam’s face was obvious. Sam isn’t buying into Dean’s various explanations for his less than positive outlook – this episode it was that he was telling Cole what he needed to hear – and we can see Sam’s resolve strengthening with each of Dean’s confessions. I think back to season 5 as an increasingly suicidal Dean insisted he wasn’t worth saving while Sam tried to pull him back from the brink. The big difference this season is that he and Sam are more of a team than they have been in years, they are both on the same page and, for the most part, there is trust between them. I feel this could be what will ultimately bring Dean around this time. While I have some questions about the episode as mentioned here I did enjoy how much forward momentum was made in the main storylines. I just would have liked to have had it spread out over more time to allow Erica Carroll and Travis Aaron Wade the ability to round out their stories in a less hurried manner. Overall, though, the episode gave us some interesting developments that will be fascinating to watch play out. What did you all think? Let us know in comments!